Another emotional day. 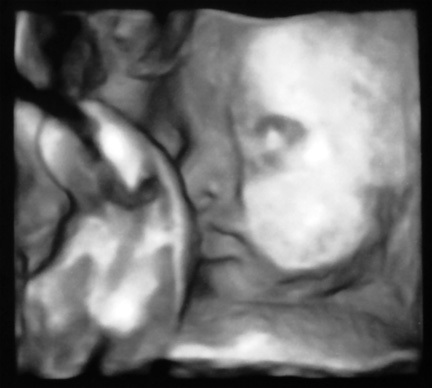 The ultrasounds with the perinatologist are incredibly stressful for me. The last one at 18 weeks told us everything was ok. We’ve done several different tests and each one brought us better and better news. And yet, I’m in a panic before every appointment. When we got our bad news 3 years ago I was so confident…over confident that everything was ok. I never, in a million years, thought we’d get bad news. So, whenever I feel confident now I worry. Am I too confident? Things can go wrong at the very last minute. Things go wrong after birth for Pete’s sake! Well, we made it through the appointment. The doctor said we were all incredibly healthy. My bp was 120/79, pulse 79. My blood work was fantastic. The baby is developing at the proper rate. All her systems, primarily her brain are perfect. The blood flow is great. She is healthy and moving a lot. In fact, she’s quite responsive to stimuli and that is a great sign. My cervix is still long despite the increase pressure I feel. All set for the due date. Dave was such a huge support. He made me laugh prior to the appointment. Although he was calm and held it together I knew he was stressed. When the lights went out and the monitor turned on with our baby girl’s image on it we held hands and I could tell he was as nervous and uptight as I was. It wasn’t until after dinner he said “I’m emotionally tired”. I was right there with him and I spent the rest of the afternoon in bed I was so exhausted. The only thing the doctor said was a little off was my weight. I’ve gained too much . Turns out at this stage in pregnancy we can control with our diet and exercise some of the genetic factors of obesity and diabetes. At 18 weeks I started working out regularly and I hit it hard. Yoga twice a week. Hiking twice a week and a walk or two in as well every week. Now, it’s time to eat a better diet. I will admit that I made way too many cookies this holiday season. I made chocolate mousse, date-nut bread, 3 kinds of cookies on top of apple pie, pumpkin pie and a few rounds of cinnamon buns. I felt it was my last and only year I could hide all food under the pregnancy. So all is good. One more appointment to go at 37 weeks. That appointment will let us know if my scar from the c-section is holding up to go ahead for a v-back. I’m praying I can at least attempt to have this child naturally. I know child birth has a direction of its own but I’d really like to have one natural child birth. I know I’m strong enough.